We’d love your help. 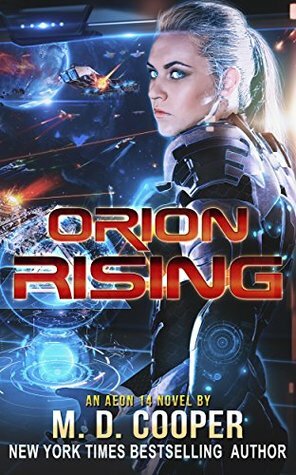 Let us know what’s wrong with this preview of Orion Rising by M.D. Cooper. Yet no one in the Orion Arm has forgotten that the colonists possess the most valuable technolo The war will come—it is inevitable. To ask other readers questions about Orion Rising, please sign up. “Orion Rising (The Orion War #3)” picks up moments in time after the cliffhanger of “New Canaan (The Orion War #2), but…..and I mean BUT….we quickly learn that the author expects you to have read six, yes six!, novellas of the “Perseus Gate” series in between books. WTF? Throughout each of the books of the Intrepid and the first two of the Orion War books, the author has shifted back and forth between characters, worlds, star systems and even time as events occur independently before people and p “Orion Rising (The Orion War #3)” picks up moments in time after the cliffhanger of “New Canaan (The Orion War #2), but…..and I mean BUT….we quickly learn that the author expects you to have read six, yes six!, novellas of the “Perseus Gate” series in between books. WTF? Throughout each of the books of the Intrepid and the first two of the Orion War books, the author has shifted back and forth between characters, worlds, star systems and even time as events occur independently before people and plots later merge into the main thread. But now, he drops that technique to create a series of books that focus on a tighter group of characters, but that features events that are crucial to the main thread. What really pissed me off is that he even killed off a main character, and we learn of it in “Orion Rising” as a spoiler for reading the “Perseus Gate” series. Worse, only two of six of the “Perseus Gate” books are available on Audible, so we can’t listen to the six in between “Orion War” books 2 and 3. Worse again, there’s yet ANOTHER narrator for the “Perseus Gate” books, and if the Audible sample is any indication, she sounds much MUCH younger than narrators Hvam and Dukehart. Finally, the REALLY annoying thing is that these six books are novellas….codeword for SHORT. The “Orion War” books have been 10-13 hours each. The “Perseus Gate” books are about 3 hours each. So all six books total the length of only two “Orion War” books. Yet…wait for it….each of the 3 hour short books costs the SAME as the longer books! I love audiobooks, but this strategy just screams ripoff and I may very well use Voice Dream to read the KU books for the “Perseus Gate” series. Interestingly, btw, the longer books are published by Tantor Audio, but these shorties are by The Wooden Pen Press. The audio quality of “Orion Rising” is much better than it was for “New Canaan”, but unfortunately some significant squeaks appeared during the final two hours to distract and annoy me. Dammit. Marketing flaws and audio quality flaws aside, “Orion Rising” was hugely entertaining. Great space battles (I love space battles! ), well done politics, and it features terrific enemies (both old and new), which always keeps things entertaining by making things difficult for Tanis, Sera and the others! If you’re reading this series, and the interweaved series on KU, pay attention to the author’s recommended reading order. It’s tough if not impossible to follow that order on Audible, because there are more books released on Kindle that Audible. Plus, did I mention that there are six books with key events that occur between the seconds of elapsed time between “New Canaan” and “Orion Rising”? It's hard to jump into the Ad on 14 I diverse if ok don't know where to start. There are so many characters, so many AI personalities to keep straight,so many worlds so many back atorirs. Let's be honest nrst, this is e nse, this u universe is complicated. The six-book starter set kinda makes it easier. At the end of the books, you can head off into five different direction. I chose to follow Rika's journey. She's a strong woman, a military genius, but she can be sympathetic empathetic and loving. M. D. Cooper does a great job with his sci-fi series, Aeon 14, and Orion Rising is no exception. He keeps up a pretty steady pace, and with this book picking up right where the previous one left off, the action doesn't let up. I really enjoy Cooper's technology and how he has AI's situated alongside (and sometimes inside) humanity. The almost nonchalant use of nano-technology is fascinating, as is the rising use of pico-tech as well. 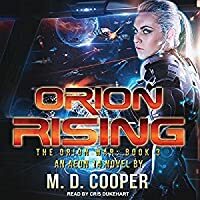 Cooper channels his inner David Weber in this book, and he doe M. D. Cooper does a great job with his sci-fi series, Aeon 14, and Orion Rising is no exception. He keeps up a pretty steady pace, and with this book picking up right where the previous one left off, the action doesn't let up. I really enjoy Cooper's technology and how he has AI's situated alongside (and sometimes inside) humanity. The almost nonchalant use of nano-technology is fascinating, as is the rising use of pico-tech as well. Cooper channels his inner David Weber in this book, and he does a good job of it, in his own little way. Though he doesn't quite achieve the visceral intensity and mind-numbing scale of some of the battles which come later in Weber's Harrington saga, Cooper manages to get pretty close in his own way. I loved Weber's space battles, and I've also greatly enjoyed Cooper's as well. Initial thoughts when first reading it were: Another great book. Compared to other books, a little less character and story development as most of the book was around one long and vast battle. Plot seems to be steadily getting more complicated, I hope it doesn't run away on the author. Always enjoyable reading about Tanis, I'm certainly interested to see what her ultimate destiny is, that all the books look to be leading to. Having reread it a couple of times now, most of that still stands, thoug Initial thoughts when first reading it were: Another great book. Compared to other books, a little less character and story development as most of the book was around one long and vast battle. Plot seems to be steadily getting more complicated, I hope it doesn't run away on the author. Always enjoyable reading about Tanis, I'm certainly interested to see what her ultimate destiny is, that all the books look to be leading to. As always, well written, full of action & drama, and fully developed characters. I love the characters (especially Tanis and Joe), but I'm tired of war. Let's have some books without full scale war, please. Also, the story is becoming too unwieldy to follow. There are too many threads going to keep up with. Bring this story to a real conclusion and then just write new books with some of the same characters in the same universe. For instance, write a whole book about what's happening on Airth As always, well written, full of action & drama, and fully developed characters. I love the characters (especially Tanis and Joe), but I'm tired of war. Let's have some books without full scale war, please. New Canaan Governor Admiral Tanis Richards faces her biggest battle yet when several enemy fleets converge on her home world. I’ve enjoyed following Tanis’s escapades until now, but this universe is getting too complex. Multiple viewpoints, diverging plot threads, and the different political factions are getting too confusing to follow. While my interest lies in Tanis and her family, I find myself skimming over the passages told from other viewpoints and caring less about those characters. Is proofreading no longer possible? "Eternal" and "internal" have completely different meanings. I feel like someone was playing with homophones while righting this book (see what happened there? It works, but it's wrong). "Adrianne" is the feminine version; "Adrian" is the masculine. So frustrating to read a book that is so poorly constructed. If you aren't going to be professional about your product, stop selling it. Whoever makes the marketing decisions need to rehire the illustrator that was responsible for the earliest of this series. I know that is cheap shot but gah, there are times when presentation is important and lead to judging a book by its cover..
Story wise, book/episode whatever has kept on track; still say a better proofreader and editor needs to be employed..
How may of these are their going to be?? I thought I might have tired of this series by now. Ready to read something else, something new, but I keep reaching for the next story in this universe. M. D. Cooper has created a cast of characters that I’ve come to care about. People whose development and story arcs I can’t wait to learn about. Well, I did have some trouble keeping track of all the characters but still found the story fun and inventive. There are more books coming out from this author in this same "universe" but I think I've had my fun. Good reading though. This book continues the story of Tanis and her people, they hoped that settling in at New Canaan would be longer. But as tends to happen, they cannot get a break. War has come a calling, but it doesn't get the result it was expecting. Recommend reading. As always Mr.Cooper writes. a winning book. That always leaves you wanting more. I love each and every one of his. This is another great read. It has enough surprise to keep you hooked. I highly recommend this book. Happy reading. I really enjoyed the military battles and all the complex plotlines. I also really enjoy all the different types of relationships this series has between the AI and human characters. I really couldn’t put this book down just like all the rest in this series! I have to start the next one immediately! Well thought out book with intriguing, developed characters. M.D. Cooper is a great story teller and he has me hooked. I keep coming back for more of his stories. I so enjoyed this series up til now, but it's become an endless chain of betrayal, war, death, etc. Not sure I can be bothered carrying on. So much is happening in such a short time!! It is crazy, everyone is showing up for the fight. Sera's mother oh lord who knew!!! Orion Rising picks up right where New Canaan left off. The story continues its mixture of military, political, and interpersonal action. This series is one of my favorites! I love the Aeon 14 universe, and the creativity of the author writing it! You never know what's going to happen! So many awesome twists, you never see coming! If you haven't read any of the Aeon 14 books, I highly recommend them! You will easily become addicted! Another fantastic book from Mr Cooper, with plenty of action and intrigue involving both the humans and AI. Never fails to keep me reading. Michael Cooper has been writing since he finished Return of the King and had to have more. Lately he has turned toward science fiction and is working on a series of books which surround a colony ship leaving the Sol system for 82 Eridani. When he's not writing novels or software he can be found spending time with his wife and daughter, or in his wood shop building furniture.